After working with a neutral palate for many years I have begun to develop this new body of work that employs colour to challenge the muted qualities of the achromatic surface to expand the conceptual goals of the work. These ceramic works grew from the evocative nature of domestic souvenirs collected over many years. These knickknacks reemerged into my life as extraordinary, familiar yet strange, seemingly possessed with a power to embody the spirits of the departed. Using these domestic artifacts as a point of departure I have developed a responsive body of ceramic works. This work is for part a research project linked to a New Work Grant from the Australia Council for the Arts. My practice explores otherworldly scenarios linked to notions relating to nostalgia, the uncanny and mortality. Often representing a journey within the dualisms of life and death, reality and fantasy, past and present, comfort and pain, self and other. 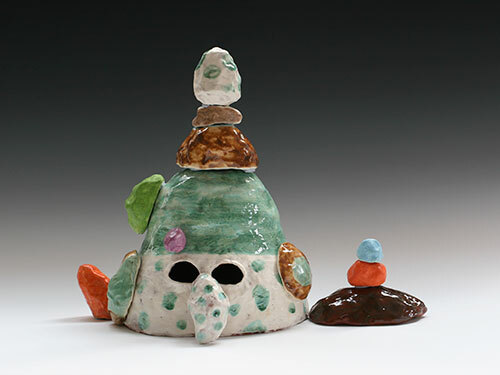 Creating these ceramic works plays a role in the mediation between loss and change. 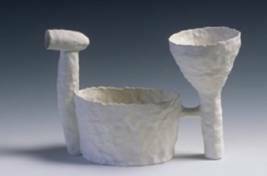 I work with a porcelaneous clay body and multiple white glaze surfaces to evoke an ethereal quality and a ghostlike presence. The Nature Interrupted series evolved in reply to the evocative nature of a group of domestic artifacts collected from a local junk shop. These remnants of suburban Australian history initially triggered a nostalgic response that projected the solace of old domestic rituals. However, something disrupted nostalgias’ seduction and comfort; uninvited unwelcome feelings invaded the present, prompting me to question this unsettling of time, emotion and memory; and the complex character of cultural settlement within the Australian natural landscape. The Home Altar series has grown from an interest in the metaphysical aspects of the domestic souvenir. These works evolved in reply to the evocative nature of a group of souvenirs collected from my childhood home prior to its sale and demolition. 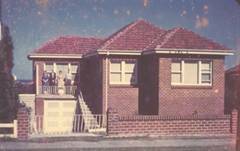 This Australian suburban house built during the 1950’s and its artifacts reemerged into my life as extraordinary, familiar yet strange; generating a peculiar conflation of past and present, memory and emotion, self and other; triggering an overwhelming nostalgia that crept into unease. On reflection this work arose from an unconscious reaction to the insecurity in the present, to a sense of alienation, to the passing of time and to an uncanny sense of death. While the works are based around evocative found objects, I have chosen the clay medium as my primary source of communication to depart from the prescriptive nature of these domestic souvenirs and to convey a sense of mystery. The aim was to transform the objects from the house into ghostlike, spirit images - interpretations of what was seemingly familiar, yet strangely uncanny. I have employed traditional ceramic technologies incorporating a variety of techniques including hand modeling using coiling and pinching techniques; press-molding clay forms from plaster cast and multiple glaze firings using various glazes to achieve desired surfaces. Wonderland is the title of the first series of ceramic sculptures to evolve from my exploration of the souvenirs from my childhood home. The ‘muse’ for these works was a small plastic toy bunny, which was the first souvenir to be incorporated into a work. On its rediscovery this souvenir triggered a longing for the maternal comfort of home, of lost childhood innocence and past family life. It also evoked a melancholy for the disappearing spaces of childhood. 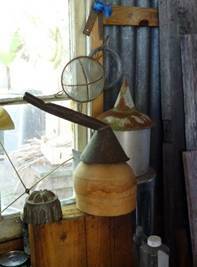 The nostalgic relationship with these objects offered an imagined defense mechanism against thoughts of death. I became sensitive to the notion that while time passes and those around us die the thing that seemed eternal was the deathlessness of these souvenirs. This series evolved from working with the domestic hardware from this house, focusing on its accumulation of kitchen utensils and working on a smaller scale relative to the intimate relationship I had with the domestic objects. These works echoed the organic seemingly animate nature of this home. They came into being through the process of abstracting from specific inanimate domestic objects, often from more than one source, then fusing them together to produce an object with an identity or life of its own. I have attempted to make ceramic sculptures with a dreamlike or ethereal quality, with the visual fragility of paper or wax but with the resilience and permanence of fired clay. This ghostly reinterpretation of these domestic items returned to inform later works. 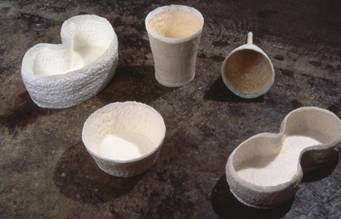 Still Life 2003, series from Thirroul Home, hand built porcelaneous stoneware, multiple glaze firings, each approx 15 x 15 x 10 cm. Collection of The International Museum of Ceramics, Faenza, Italy. 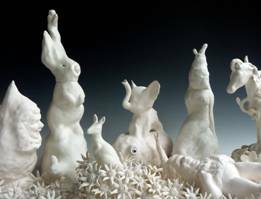 An installation of these works won the Premier Acquisition Award 54th Concorso Internazionale della Ceramica D’art, International Museum of Ceramics, Faenza, Italy in 2005. The first series of work that evolved from my home at Thirroul was exhibited in 1993 at Black Gallery in Sydney. 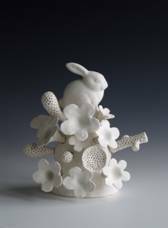 Curated by Mikala Dwyer the exhibition presented three series of ceramic works made over a period of two years. A large floor installation measuring 4 x 4 x 4 metres, consisting of large scattered ceramic and wax objects, was the starting point to my more current work and my investigations into the resonances of domestic objects and their psychological associations. This work was inspired by metal washing basins, buckets and funnels from the old bathhouse. The hybrid nature of the wall pieces in the exhibition would be used in future work and the wax surfaces would be interpreted using a combination of glazes and firings. 1987- 1999 Early coloured pinched works. 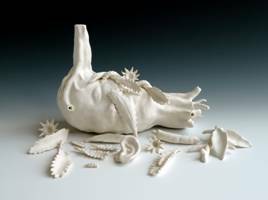 These works allude to the flesh, the tactile fragility of clay and the sensuality of fresh paint. I was working with clay in a way that utilizes its direct qualities. The technique of ‘pinching’ and the direct application by brush of engobes, underglazes and glazes was for me way of exploring the nexus between tradition and innovation. I was attempting to push the material (porcelain) to new technical and aesthetic limits, breaking down the barriers between surface and structure. 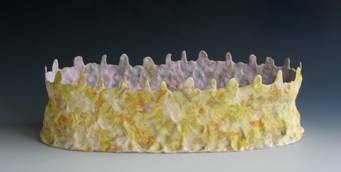 It was the purity and fineness of the body and its fired strength that allowed me to build vessels where the texture of the surface appears to become a part of the colour field rather than a part of the clay structure.